The theory of the Asiatic mode of production (AMP) was devised by Karl Marx around the early 1850s. The essence of the theory has been described as "[the] suggestion ... that Asiatic societies were held in thrall by a despotic ruling clique, residing in central cities and directly expropriating surplus from largely autarkic and generally undifferentiated village communities". Karl Marx stressed that the Asiatic mode of production differed from all other modes of production. In his famous and widely quoted articles on India written between 1852 and 1858 he outlined basic characteristics of Asiatic mode that prevailed in India. In these articles he drew sketch of society by arguing that handloom, spinning wheel, and union between agriculture and manufacturing were the basis of Indian society before it was uprooted by British steam and science. He also described that all kinds of invasions, conquests, and famines etc. remained on its surface and never penetrated within foundations of society. Thus despite of many invasions occurred in almost three millennia but all the invading tribes and dynasties were not able to destroy its basic structure rather were absorbed by the rich culture and fertility of this land. The theory continues to arouse heated discussion among contemporary Marxists and non-Marxists alike. Some have rejected the whole concept on the grounds that the socio-economic formations of pre-capitalist Asia did not differ enough from those of feudal Europe to warrant special designation. Aside from Marx, Friedrich Engels was also an enthusiastic commentator on the AMP. They both focused on the socio-economic base of AMP society. Leon Trotsky in his writings on China, contradicted the idea of ‘Chinese feudalism’ rather resembled with AMP. The relations of production, which are the social relationships formed as human beings are united ("verbindung") in the processes of the production of socially useful goods. “Amidst oriental despotism and the propertylessness which seems legally to exist there, this clan or communal property exists in fact as the foundation, created mostly by a combination of manufactures and agriculture within the small commune (…) A part of their surplus labor belongs to the higher community, which exists ultimately as a person, and this surplus labor takes the form of tribute etc., as well as of common labor for the exaltation of the unity, partly of the real despot, partly of the imagined clan-being, the god". The Asiatic mode of production is a notion that has been the subject of much discussion by both Marxist and non-Marxist commentators. The AMP is the most disputed mode of production outlined in the works of Marx and Engels. Questions regarding the validity of the concept of the AMP were raised in terms of whether or not it corresponds to the reality of certain given societies. Historians have questioned the value of the notion of the AMP as an interpretation of the "facts" of Indian or Chinese history. The acceptance of the AMP concept has varied with changes in the political environment. The theory was rejected in the Soviet Union in the Stalinist period. Karl August Wittfogel suggested in his 1957 book, Oriental Despotism: A Comparative Study of Total Power, that his concept of Oriental despotism showed that this was because of the similarity between the AMP and the reality of Stalin's Russia, he saw the authoritarian nature of communism as an extension of the need of totalitarian rule to control water in "the Orient". The Marxist historians such as John Haldon and Chris Wickham have argued that societies interpreted by Marx as examples of the AMP are better understood as forms of what he called the Tributary Mode of Production. The TMP is characterized as having a "state class" as its specific form of ruling class, which has exclusive or almost exclusive rights to extract surplus from peasants over whom, however, it does not exercise tenurial control. ^ Lewis, Martin; Wigen, Kären (1997), The Myth of Continents: A Critique of Metageography, Berkeley: University of California Press, p. 94, ISBN 978-0-520-20743-1. ^ a b Husain, Iqbal (2008). Karl Marx On India. Tulika Books. ISBN 9788189487416. ^ a b "The British Rule in India by Karl Marx". www.marxists.org. Retrieved 2018-12-22. ^ Krader, Lawrence (1975), The Asiatic mode of production: sources, development and critique in the writings of Karl Marx, Assen: Van Gorcum, ISBN 978-90-232-1289-8. ^ a b "Brian Pearce: Marxism and the Asiatic Mode of Production (2002)". www.marxists.org. Retrieved 2018-12-22. ^ Marx, Karl (1875), "Critique of the Gotha Programme", Marx & Engels Selected Works, 3, Moscow: Progress Publishers, pp. 13–30. ^ Marshall, Gordon (1998), "Asiatic mode of production", A Dictionary of Sociology, retrieved 22 August 2010. 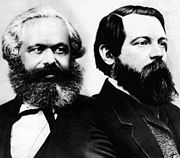 ^ "Letters: Marx-Engels Correspondence 1853". marxists.catbull.com. Retrieved 2018-12-22. ^ Rahman, Taimur (2012). The Class Structure of Pakistan. Oxford University Press. ISBN 9780199400126. ^ "Economic Manuscripts: Preface to A Contribution to the Critique of Political Economy". www.marxists.org. Retrieved 2018-12-22. ^ "Karl Marx: Grundrisse". www.marxists.org. Retrieved 2018-12-22. ^ "Economic Manuscripts: Capital: Volume One". www.marxists.org. Retrieved 2018-12-22. ^ Hindess, Barry; Hirst, Paul (1975), Pre-capitalist Modes of Production, London: Routledge & Kegan Paul, p. 178, ISBN 978-0-7100-8168-1. ^ Offner, Jerome (1981), "On the Inapplicability of 'Oriental Despotism' and the 'Asiatic Mode of Production' to the Aztecs of Texcoco", American Antiquity, 46 (1): 43–61, doi:10.2307/279985, JSTOR 279985. ^ Legros, Dominique (1977), "Chance, Necessity and Mode of Production: A Marxist Critique of Cultural Evolutionism", American Anthropologist, 79 (1): 26–41, doi:10.1525/aa.1977.79.1.02a00030 , p.38. ^ Wittfogel, Karl (1957), Oriental Despotism; A Comparative Study of Total Power, New Haven: Yale University Press. ^ Haldon, John (1994). The State and the Tributary Mode of Production. Verso. ^ Wickham, Chris (2005). Framing the Early Middle Ages: Europe and the Mediterranean 400–800. Oxford University Press. Karl Wittfogel, Oriental Despotism: A Comparative Study of Total Power. New Haven, CT: Yale University Press, 1957. Andrea Zingarelli, "Asiatic Mode of Production: Considerations on Ancient Egypt," in Laura da Graca and Andrea Zingarelli (eds. ), Studies on Pre-Capitalist Modes of Production . Chicago: Haymarket Books, 2016. This page was last edited on 11 April 2019, at 04:45 (UTC).